Side release buckles are seen mostly on belts; seat belts, hipblets,etc. One side of the buckle is stabilized by either sewing or with loop create with a Slider. The other side is adjustable by drawing up loose webbing through the buckle until it is tight enough. Once the webbing is adjusted, you can clip or unclip the buckle on or off. This is the same non-metallic hardware being used by many ?quality conscious? manufactures of outdoor gear. 3/8", slightly curved. Color: Clear We have provided several views of the buckle above but please note that for this price you only get one buckle. Note: All buckles are measured by millimeters during the manufacturing process. 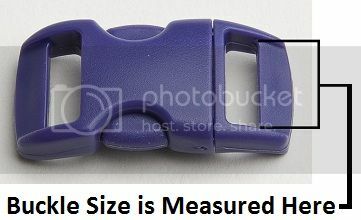 This does make the size of the buckles come out to approximately 1/16" larger than 3/8".